Take about 10 mL of water each in two test tubes. Add a drop of oil (cooking oil) to both the test tubes and label them as A and B. To test tube B, add a few drops of soap solution. Now shake both the test tubes vigourously for the same period of time. Can you see the oil and water layers separately in both the test tubes immediately after you stop shaking them? Leave the test tubes undisturbed for some time and observe. Does the oil layer separate out? In which test tube does this happen first? This activity demonstrates the effect of soap in cleaning. Most dirt is oily in nature and as you know, oil does not dissolve in water. The molecules of soap are sodium or potassium salts of long-chain carboxylic acids. The ionic-end of soap dissolves in water while the carbon chain dissolves in oil. 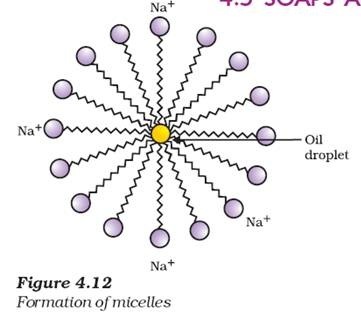 The soap molecules, thus form structures called micelles (see Fig. 4.12) where one end of the molecules is towards the oil droplet while the ionic-end faces outside. This forms an emulsion in water. The soap micelle thus helps in dissolving the dirt in water and we can wash our clothes clean (Fig. 4.13). Can you draw the structure of the micelle that would be formed if you dissolve soap in a hydrocarbon? these molecules have a unique orientation that keeps the hydrocarbon portion out of the water. This is achieved by forming clusters of molecules in which the hydrophobic tails are in the interior of the cluster and the ionic ends are on the surface of the cluster. This formation is called a micelle. Soap in the form of a micelle is able to clean, since the oily dirt will be collected in the centre of the micelle. The micelles stay in solution as a colloid and will not come together to precipitate because of ion-ion repulsion. Thus, the dirt suspended in the micelles is also easily rinsed away. 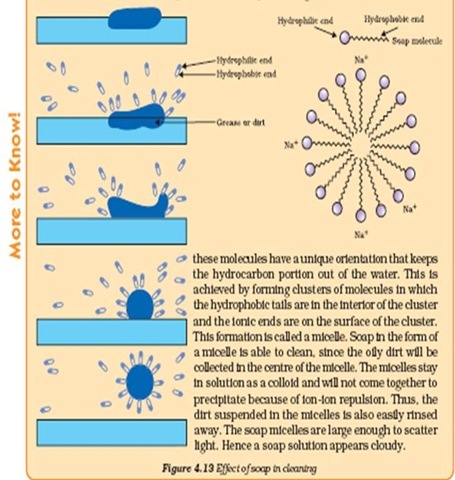 The soap micelles are large enough to scatter light. Hence a soap solution appears cloudy. Take about 10 mL of distilled water (or rain water) and 10 mL of hard water (from a tubewell or hand-pump) in separate test tubes. Add a couple of drops of soap solution to both. Shake the test tubes vigorously for an equal period of time and observe the amount of foam formed. In which test tube do you get more foam? In which test tube do you observe a white curdy precipitate? Note for the teacher : If hard water is not available in your locality, prepare some hard water by dissolving hydrogencarbonates/ sulphates/chlorides of calcium or magnesium in water. Take two test tubes with about 10 mL of hard water in each. Add five drops of soap solution to one and five drops of detergent solution to the other. Shake both test tubes for the same period. Do both test tubes have the same amount of foam? In which test tube is a curdy solid formed? Have you ever observed while bathing that foam is formed with difficulty and an insoluble substance (scum) remains after washing with water? This is caused by the reaction of soap with the calcium and magnesium salts, which cause the hardness of water. Hence you need to use a larger amount of soap. This problem is overcome by using another class of compounds called detergents as cleansing agents. Detergents are generally ammonium or sulphonate salts of long chain carboxylic acids. The charged ends of these compounds do not form insoluble precipitates with the calcium and magnesium ions in hard water. Thus, they remain effective in hard water. Detergents are usually used to make shampoos and products for cleaning clothes.